I have an idea for a scene in a novel where something or someone who is starving eats plaque off of something or someone's morning teeth. I have an idea for a book where a bishop's cordless phone gets all messed up so he can hear other people's conversations in the ward. It's a romance novel. I made a note to myself to write a blog which explains how Friday Night Lights is the nouveau country of TV shows. In other words, Friday Night Lights = Wilco. I heard a rich realtor on a reality TV show say that his motto is "Work hard. Play hard." I've been meaning to write a blog post about how this motto might apply to my life. I just don't play hard enough for it to be relevant. I've been wanting to explore the idea that jurisdiction fights like you see in cop shows on TV only occur on TV. 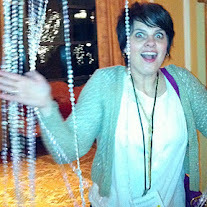 I have been wanting to title a blog post "Not if Anything to Say About it I Have." Any ideas about how to make it work? It's highly nuanced, you see. I want to either write a post about myoclonic jerks or call someone a myoclonic jerk--whichever would be better. A myoclonic jerk is what happens when you are about to fall asleep. It feels like falling. For me, candy is an important part of my family culture. I always want to blog about it but I'm just not ready for an onslaught of critical comments--certainly not about something so, well, special to me. One year my kids really wanted to get an mp3 player for their little brother Ben. As fate would have it, he ended up with Christian's old iPhone before Christmas even came. It was kind of like Gift of the Magi, but not really close enough to write a blog about it. I like this quote by Emerson: "No man ever stated his troubles as lightly as he meant." It's why I always say "fine" whenever anyone ever asks me anything. But it's not so great in terms of keeping up my end of a conversation. I find exaggeration works much better? Here's a related quote that I often think about in terms of blogging and life in general: "What makes a good story ain't what makes a good person." Is the success of my blog inversely related to the quality of my soul? Obviously, this is true in Dooce's case. And here is the premise of another unwritten blog post: Right here, right now we are living in what will be referred to in the future as "The Golden Age of TV." Is this more exciting or more disappointing? Because I think it might be true. 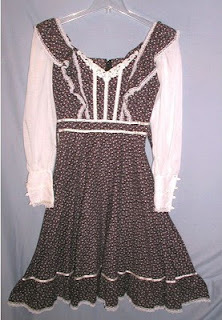 And finally, WHAT WAS THE DEAL WITH GUNNE SAX DRESSES?! Sometimes I stalk your blog. But I had to let you know your comment about Dooce made me just snort water out my nose. Nice work. First time commenter...long-time stalker (came over from LRS). Just to clarify--those jerks are myoclonic, not myclonic. My little boy suffered from 100s of myoclonic and other horrible types of seizures for almost two years before getting them controlled. I could definitely help you out with a blog post there. Not pretty. When you figure out the Gunne Sax dresses, please let me know. Also, what makes a good story doesn't make a good person? Not always the case, but if we're talking a scandalous story, that's probably true. I want to read your Bishop's telephone romance. Well, you did a whole post of ideas for whole posts. Maybe the sum of the parts is indeed the whole. I learned in Psychology (AP!) that when you have a dream associated with those my(o)clonic that it's actually your brain making up the dream in response to the jerk. Your brain makes it up backwards and tricks you just to make sense of it within your subconscious. Oh, and if you want to do some investigation on gunne sax dresses you could always wander around the Walmart in St. Greorge. I find that there is a direct correlation between Gunne Sax dresses and long, thick braided hair. I don't think I'm smart enough to comment here. I only figured out what a myoclonic jerk was from Rob's comment. This blog is a good ejumucation for me. Gunne Sax dresses is to the early 80's as Girbaud jeans is to the early 90's, which is to say they were the vehicle for stupid, poor kids blow their whole summer's savings on one item as a means to fit in in school. Idiots. 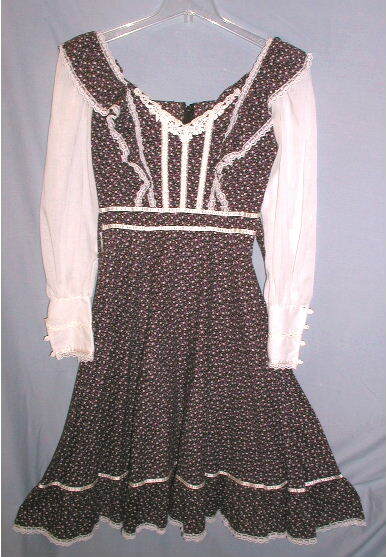 Ok, so maybe I don't know what a Gunne Sax dress is. I just thought it looked like polygamist clothing. Whether they are "myo" or "my" clonic, *my* husband has 'em baaad. (Otherwise known in our house as "the jimmie legs.") I sometimes pretend to have them too just so I can kick him back. Love the Dooce references. So sick of that broad. I like that candy is part of your family culture. We live in dangerous times, and admitting that seems daring and reckless! Also, I need more information on Friday Night Lights. Write that one and weave in your ideas about "The Golden Age of Television." It could be your greatest work ever. I've said it before: Dooce is only famous because she was first in line. Dooce is just unbearable. On the other hand, your blog is always the highlight of my day. The Dooce comment made me laugh out loud, hard, (although I think this might make me an uncharitable person). Christy, I've heard of something called Restless Leg Syndrome--could that be what your husband has? the dooce comment made my whole day. and i think that candy is an integral part to any family. whether they admit it or not. and kids who don't get candy turn into adults who pick on people who give their kids candy. The deal with Gunne Sax dresses is that they are awesome. When I was a kid we used to got to the outet in the fashion district in LA and get our Christmas and Easter dresses. I mean, who didnt want to look like Nellie Olson? I fear that the Golden Age of TV only very recently came to an end. (I know you know where I'm coming from with this.) And if that is true, then what kind of future do we have to look forward to? Maybe a new age of TV, where we can interact with the shows and choose what happens, a la choose your own adventure. Then I wouldn't be so good at predicting every single last plot point. It's a rare, enviable gift, I know. The score quickly went from dooce to advantage Kacy. Now serving breakfast for the game, set and match. If wearing slippers to a gas station is a sign of teenage rebellion, what does it mean when I wear mine to the library and YW volleyball practice?